The PRECIOUS METALS sector closed 2015 entrenched in a seemingly forever bear market, writes Jordan Roy-Byrne at TheDailyGold. Most of the sector has been in a bear market for over four and a half years. 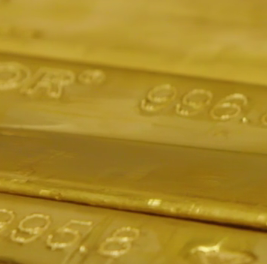 Gold's bear market will reach four and a half years in a few months. Meanwhile the US Dollar's bull market remains strong and is likely to continue. 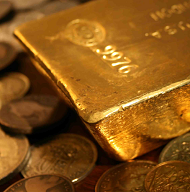 In this article we discuss our 2016 big picture outlook for the US Dollar, gold and gold stocks. The US Dollar index will be a major focus of 2016. The greenback is currently consolidating and correcting below important resistance at 100 on its trade-weighted index. A strong break above 100 could trigger a sharp move higher. 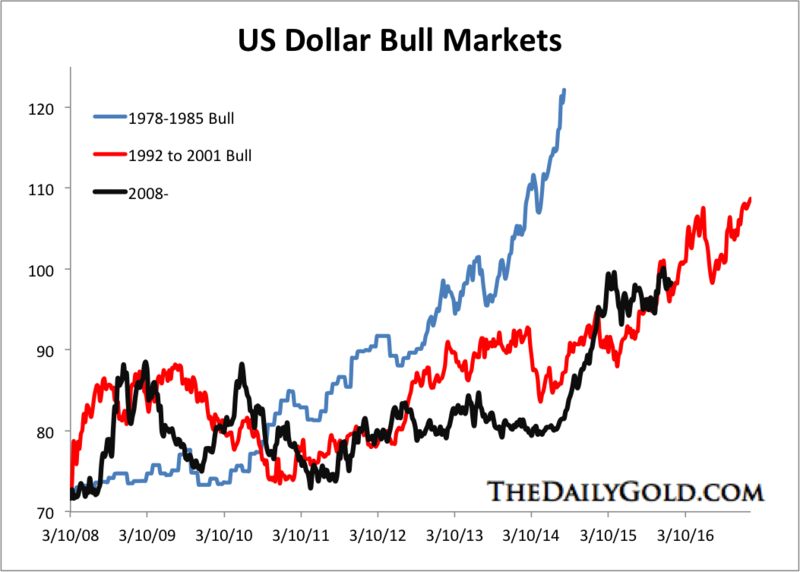 Note that the other two bull markets in the US Dollar gained strength as they neared their end. A sharp move higher in 2016 may not sustain itself into 2017. Gold's bear market is likely to continue in 2016 but the following chart makes a strong case for its death before 2017. 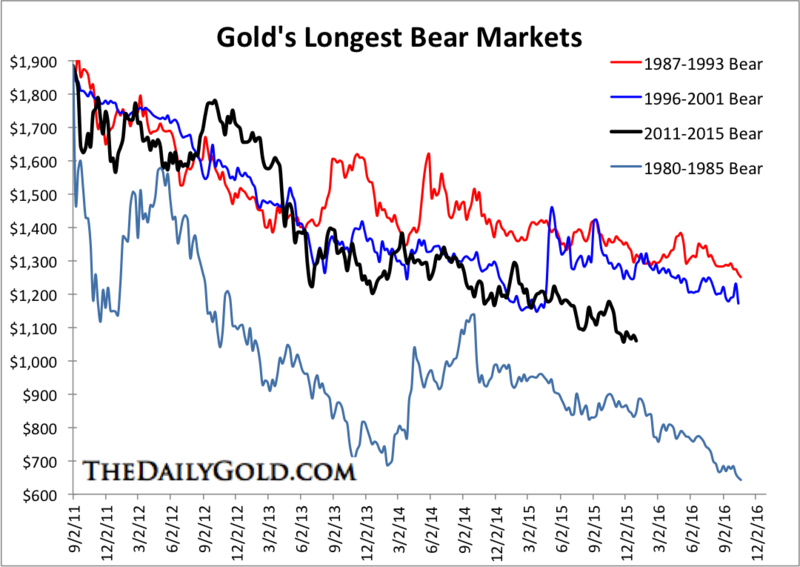 Based on the current scale, no bear market in gold has lasted past October 2016. Furthermore, note that the three other long bear markets enjoyed much larger rallies during their bears. Whereas, in weekly terms, gold has not rebounded more than 11% in two years and has not rebounded more than 15% since this current bear market began. 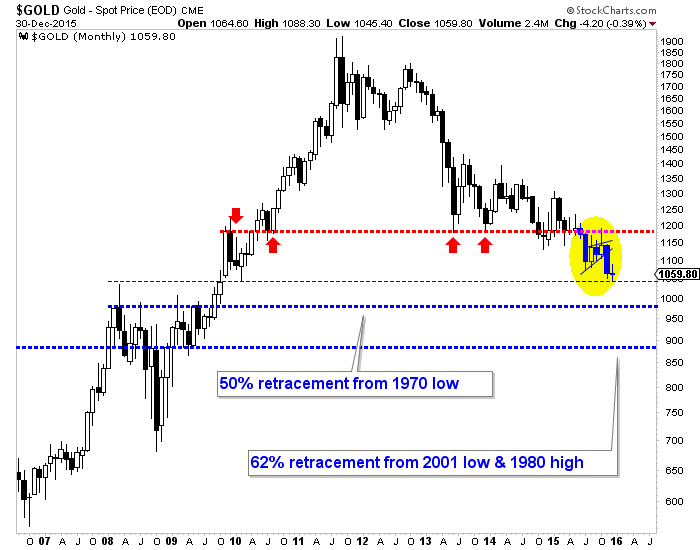 Gold's monthly chart makes the same case that the bear market will continue in 2016 but likely end before 2017. Gold failed to hold $1180 per ounce and although it could rally in January 2016 it figures to test $970-$1000 per ounce. There are very strong support targets at $970 per ounce and $890 per ounce. Another leg higher in the greenback would likely coincide with gold testing one or both of those targets. Be sure to keep in mind that gold has a tendency to bottom several months ahead of peaks in the US Dollar. The gold mining sector has been absolutely devastated. The current bear market is already the worst ever in price and if it lasts into the second quarter of 2016, then it would be the longest ever. 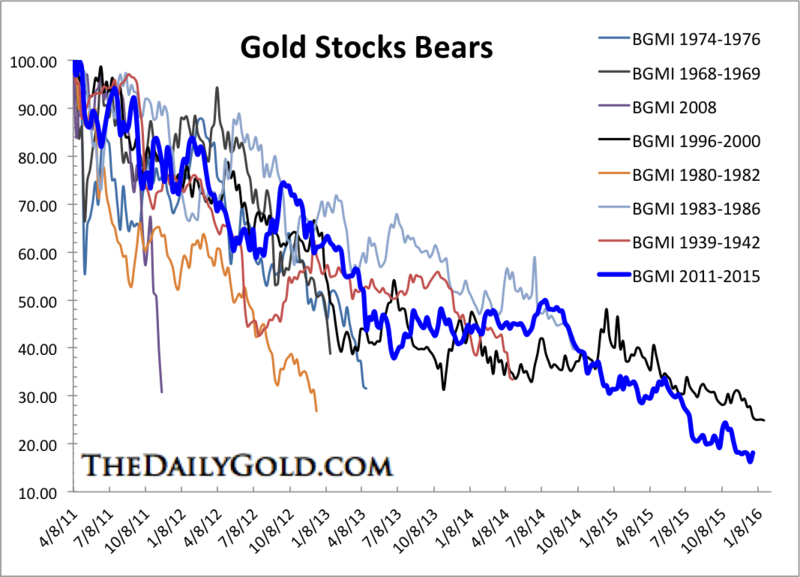 The following chart shows the bear markets in the gold mining stocks dating back nearly 80 years. It is hard to imagine the bear market lasting much longer than another quarter or two. There are some positive signs for the gold stocks. 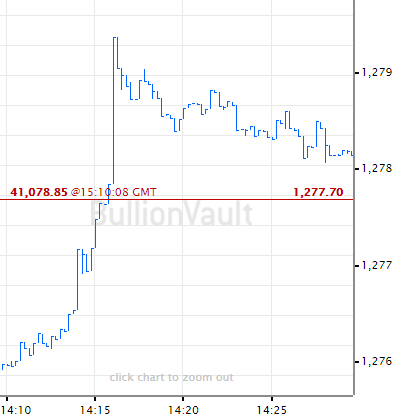 First, the mining sector – unlike gold bullion itself – has not made a new low in recent months. That is a positive divergence. If gold stocks continue to hold their lows in the event of $1000 gold, it would be a stronger bullish signal. 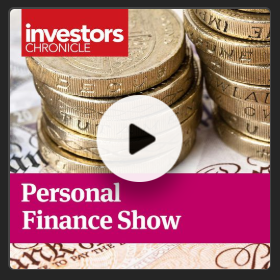 In addition, some recent macroeconomic developments have greatly improved the fundamentals for some parts of the sector. The crash in energy prices is a huge boon for companies who own or operate open pit mines. Fuel can amount to 30% of the cost for those mines. Also, companies operating mines in Canada and Australia are benefitting from the collapse in those currencies. The majority of their expenses are in local currencies which have lost quite a bit more value in the past few years than gold. Some companies, because of these developments are in a better position than they were a year and two years ago. But while the long-term downside risk for precious metals is quite low, we must note the likelihood of US Dollar strength, plus gold testing lower levels before this bear market ends. That is the risk in 2016 but it would create an excellent buying opportunity. We remain cautious on the metals but are constructive on select companies which we expect to lead the eventual recovery. As we navigate the end of this bear market, consider learning more about our premium service including our favorite junior miners which we expect to outperform in 2016.